The weather forecast was not promising. However, as usual we didn’t let that put us off. Dan, Bruce, Sarah and Keyna met up in Llandovery early on Friday evening for a visit to the chip shop (and the pub, while we waited for the chip shop to open), by which time the rain was already heavy. As we journeyed deeper into Wales, the planned convoy quickly split up as Keyna’s satnav took her and Dan down some random B roads to an encounter with an impassable ford. A few U-turns later, they eventually arrived at Tyncornel about half an hour after Sarah and Bruce, whose satnav had taken them straight to the front door with only a few encounters with deep puddles. We all took up residence as close to the log fire as possible, listening to the gathering storm outside and awaiting the arrival of everyone else. A few beers and small red wines were drunk as the evening progressed, and unsurprisingly, it was well after 3am by the time the last people went to bed. Just a few hours later, everyone was woken up by a persistent, Keyna-shaped alarm clock: “It’s 8am people! Time to get up! And look – ” (opens window to chorus of grumbles) ” – it’s not raining any more!”. Some reacted better to this than others: for the first time in living memory, Claire was up before Alan. The originally-mooted departure time of 9.30 came and went as the rain started again; shortly afterwards, frustrated with all the faffing, Keyna, Alastair and Paula set off to walk to Dolgoch (which is just as remote as Tyncornel). It was windy, raining, cold and miserable. They couldn’t chat until the afternoon as they couldn’t hear each other for all the weather and their hoods right up to protect from the rain! They didn’t even make it to Dolgoch in the end: about 800m from their destination, the floodwaters thwarted them. They couldn’t cross what would normally be a little stream, now a flooding torrent threatening to wash them into the flooded river below and to certain death. They had cursed the quality of the path that followed the bigger river on the way in. 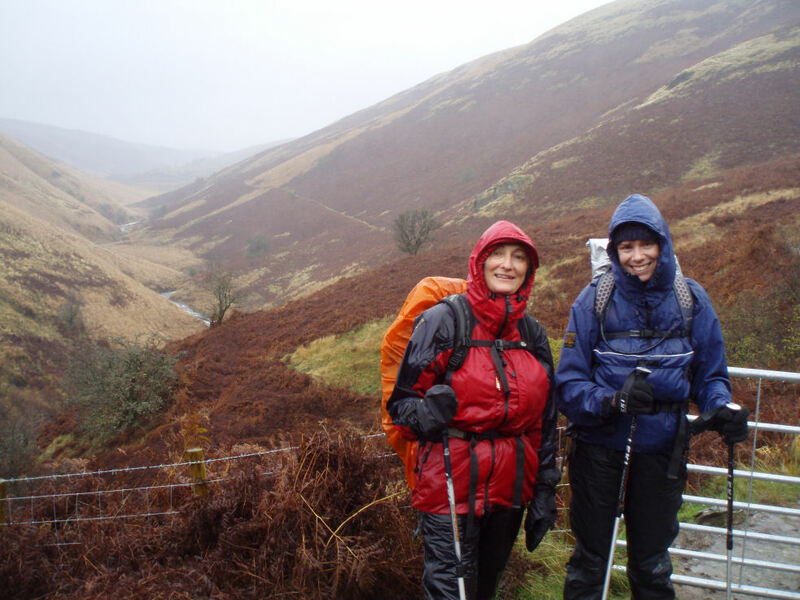 On the way back they lost the path and the tussocks, flooded with water, were really exhausting to navigate through. When they found the path again, by comparison it was a sweet walk in the park – no more complaints! And of course the good thing about leaving early was that they were back at Tyncornel before dark. The others opted for Plan B, which was to set off just as soon as everyone was out of bed. Dan got up 15 minutes before the 11.30 departure and was still ready to go first. 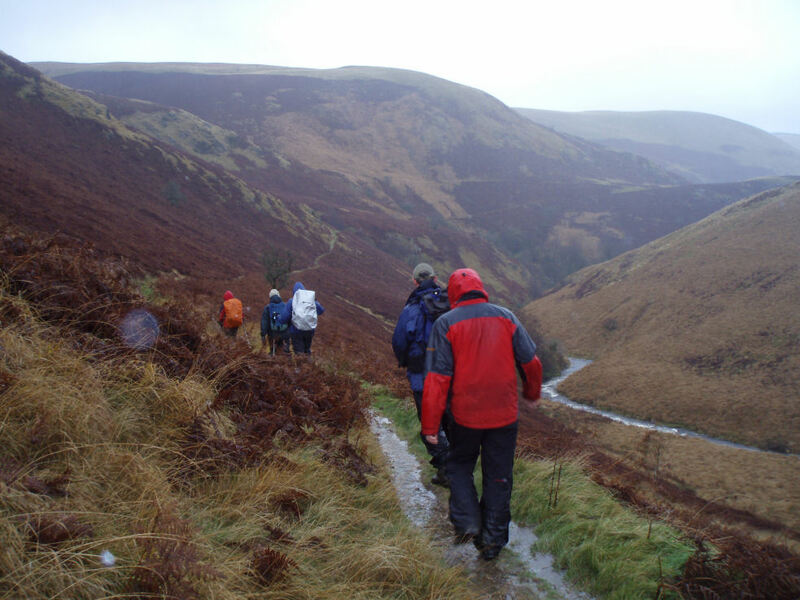 It was still raining, and the showers remained heavy and persistent until the last hour or so of the walk. The group headed south east along the same track as Keyna & co some time earlier, but then branched off south to follow the side of the valley with the Afon Doethie flowing below, looking like a candidate for some scary white-water rafting. At the river junction they picked up a wide track for a steep uphill slog to the standing stones at Cefn Cnwcheithinog (the woolly mammoth skull was still there, but the wind and rain had picked up so they didn’t stop for long) and then down to Bryn-ambor. Here Dan, our chef for the evening, opted for the route back through the former forest at Bryn Mawr (felled since our last visit), which was shorter but had unknown terrain. Everyone else took the road option, and got to see a red kite in impressive close-up. 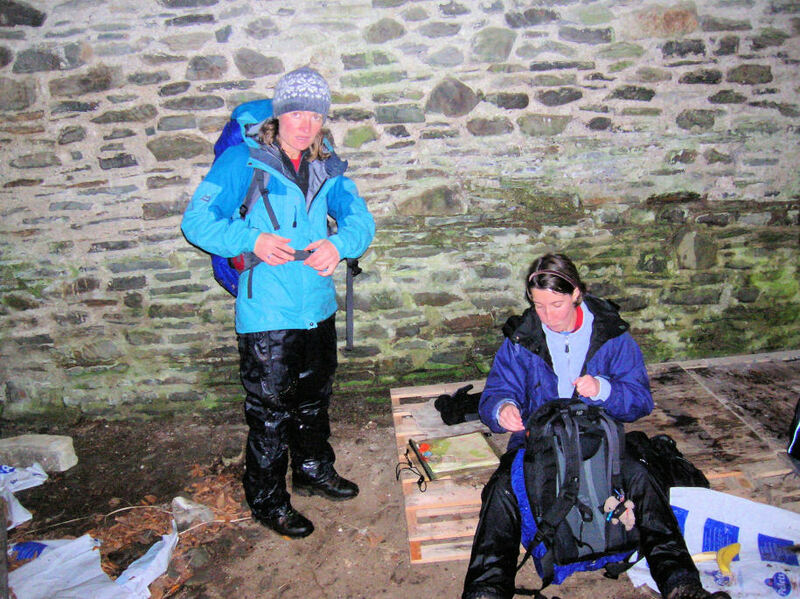 They arrived back at the hostel after 5pm in the dark, a couple of hours later than the other walkers. There isn’t a lot to do at Tyncornel in the evenings except eat, drink, and feed the fire. 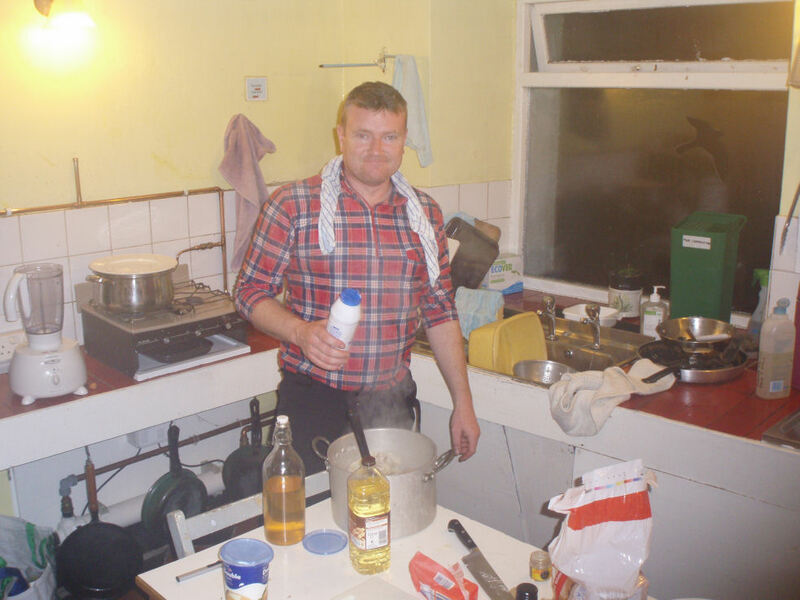 With this in mind and in memory of Keith Floyd, Dan served up a 5-course gastronomic feast, preceded by mulled wine. Quite an impressive feat considering the kitchen boasted only six hob rings of varying efficiency and a table-top oven. 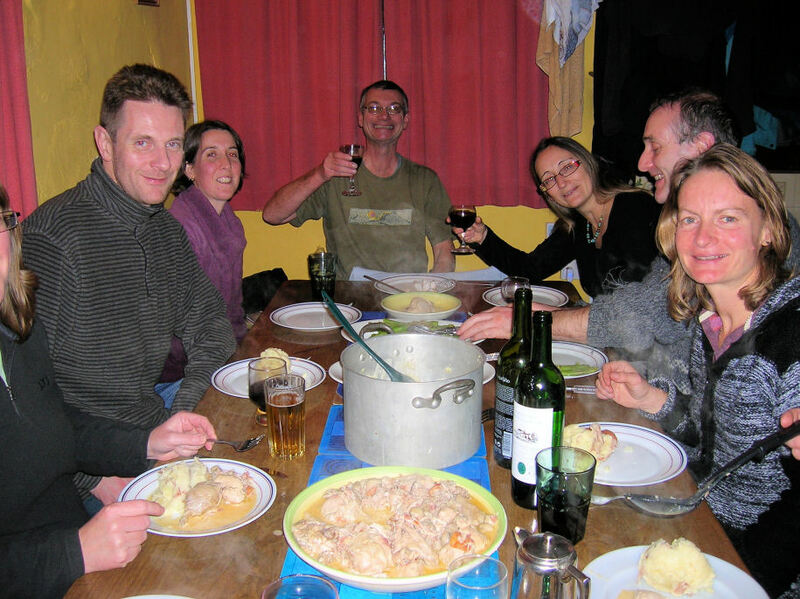 Despite frequent protestations along the lines of “I can’t eat another thing!”, everyone did justice to the courgette and parsnip soup, pork satay, chicken Celestine with mash and vegetables, and chocolate sticky toffee pudding, and were still going strong on the cheese and biscuits close to midnight. Bruce’s iPod kept us musically entertained; Alan learned how to drive it and we were fortunately spared his threat to get out his cassette player to give us some “real” music. 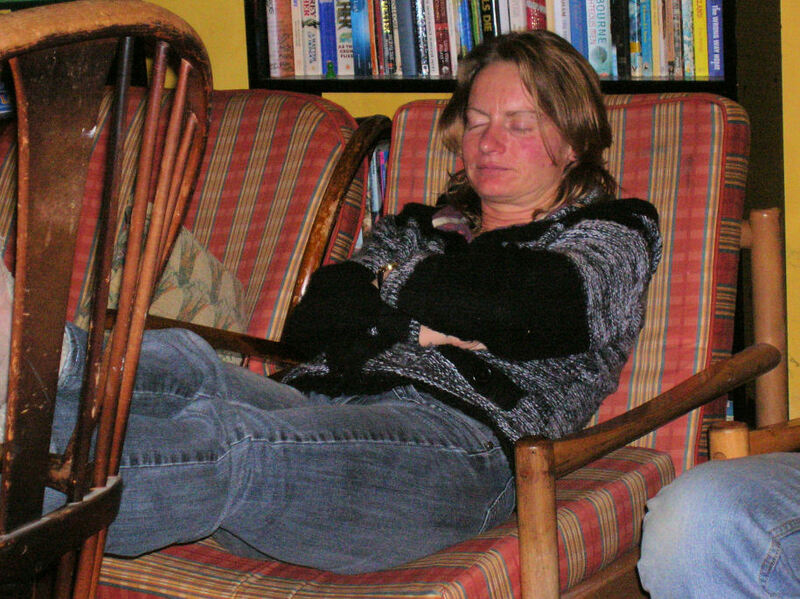 Once again it was a late one, with Paula doing a sterling job in tidying up both crockery and people in the wee small hours. On Sunday morning the weather looked more promising (you could see the hills, for a start), and Keyna, Claire and Alan departed on a 32km bike ride. To quote Keyna, “If you want a couple of intrepid biking buddies, go with Alan & Claire. Slow but steady.” Alan was a little prone to falling off – completely over the handlebars on one occasion, which would have been funny if he hadn’t hurt his elbow. Keyna fell off in slow motion later – in sympathy to Alan more than any other reason such as incompetent riding. By the two-thirds mark of the ride, Alan was walking up the all the hills. By the nine-tenths point, so was Claire. Keyna, unperturbed and still on two wheels rather than two feet, raced back to grab a quick shower before anyone else even had to queue.